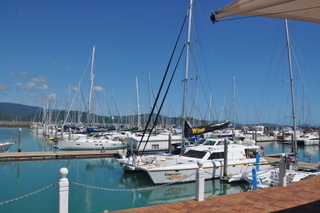 We left yesterday morning after breakfast for a boat ride to the Whitsunday Islands. 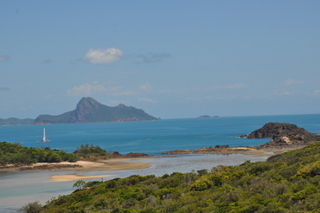 There are over 70 islands in the area just of the Australian shore near Airlie Beach first spotted by Captain Hook! We were part of a charter on a boat called the Big Fury. We were met on shore by this exuberant Australian named Brayden who was our tour guide for the day. 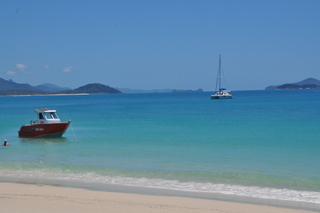 We started with about an hour on the boat that took us to Whitehaven Beach. This beach is famous for its silica sand that is one of the purest beaches in the world, very similar to Lake McKenzie that we visited on Fraser Island earlier in the week. We spent about 2 1/2 hours on the beach and the water was just awesome. We were given stinger suits to make sure we don’t get bit by jelly fish. I am starting to think that the stinger suits is a way for them to make extra money and make tourists look like idiots 🙂 I have no interest in being stung by a jelly fish, but these body suits on a beautiful day looked mighty funny. They told us that we even needed to wear them at the beach. I can understand wearing them while snorkeling, but at the beach? Either way, it was beautiful. Drew and I were able to take a walk to the top of the mountain overlooking the beach and took some very nice pictures. We were also able to have a nice talk, which we have been doing a lot of on this trip. Drew loving the boat ride! Of all the things that I wanted to happen on this trip, getting our family to be more connected was the top objective. In Carlsbad we all had our own lives and everyone was going in a million different directions with school, sports, friends, events and so much more. We didn’t have much time for each other. I’m pretty certain that when we return the same thing will probably happen, but for now we are getting much more connected and talking as a family and individually. It has been really fulfilling for me. In addition, I’m starting to relax about all the things that have been on my mind and just trying to enjoy the experience each day. As for enjoying, the best part of the day for me was the snorkeling. I’ve been thinking about the Great Barrier Reef for over 2 decades and I’m finally here. 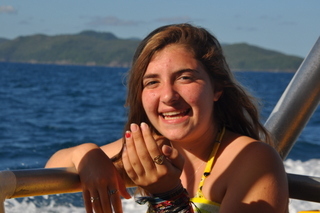 We were able to spend about an hour snorkeling amongst the amazing coral reef and seeing so many fish. If you were ever in our apartment in Riverdale you probably saw our 100 gallon salt water fishtank. If not, we had one and it was something I could look at every day in amazement. So, seeing this ecosystem in person is really special. I have actually asked the contractor on the new house to build in a frame in the wall to support a 200 gallon tank that I would like to put in at some point in the living room. I love this environment and feel so much at home here. I took about 40 minutes of video and will take much more in the coming week and I will create some films as we travel. Today is a 7 hour drive day from Airlie Beach to Cairns, so I believe it is time to wake everyone up and start getting on the move.